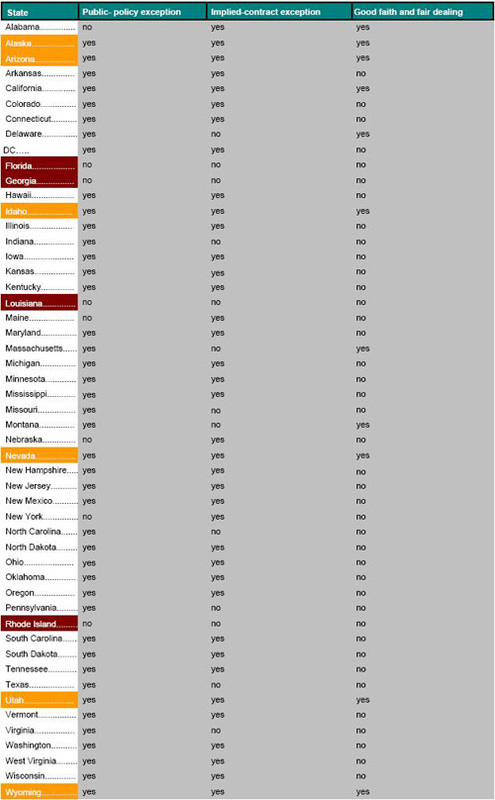 Orange = States with all three exceptions. Red = States with no exceptions. Explanations of exceptions are below. Even if you do not have a formal employment contract many employers have stated policies, either orally or in writing, regulating dismissals in the workplace and other rules. These implied contracts are recognized in 38 states and usually take the form of employee handbooks guaranteeing that employees will be terminated only for “just cause” or for non-arbitrary reasons. If you live in one of these 38 states and you have an employee handbook that outlines procedures for termination of employment then you may not be an at will employee. This exception is recognized by only 11 states and, at its broadest, is understood as meaning that in every employment relationship, there is the understanding employees should be terminated for “just cause.” More specifically, that employees should not be fired because of malice or other arbitrary reasons.